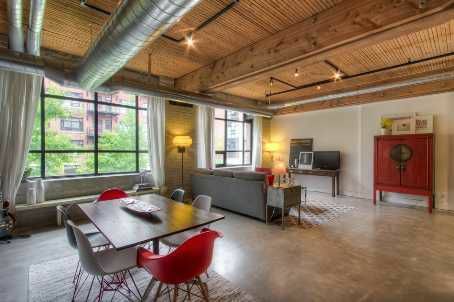 Stunning Hard Loft In The Sought After Broadview Lofts. Beautiful Details Throughout Including Polished Concrete Flrs, Exposed Brick, Factory Style Windows, Posts & Beams & Original Steel Fire Door. A Full Size Kitchen W/Island & Breakfast Bar Is Perfect For Entertaining & Complements The Welcoming & Inspiring Open Plan Living Area Of Over 1000Sqft. This Is Topped Off W/A Rare 250Sqft Private Rooftop Terrace W/Expansive Views, Hydro & An Irrigation System.